The Anzac Bridge is one of Sydney’s most popular landmarks, and a must-visit for anyone touring Sydney. Opened to the public in 1995, the bridge was originally known as the Glebe Island Bridge and is the longest cable-stayed bridge of its kind in Australia. The bridge, which is a key connection between the city’s suburbs in the west and the CBD, measures 800 meters long, with two 120 meter high towers. Three years after it was opened, the bridge was given its current name in honour of members from the Tasman who constituted the Australian and New Zealand Army Corps (ANZAC). During the 2000 Sydney Olympics, the bridge made for a magnificent back drop as marathoners approached the 28-kiloemtre mark. Today, the bridge carries about 180,000 cars daily, and is one of Sydney’s busiest sections in the city’s transport network. For pedestrians and cyclists, there is a pedestrian path and bikeway that runs on the northern side of the bridge. This makes it easy to enjoy a leisurely stroll in the evening as you soak in the sights and sounds of Sydney. 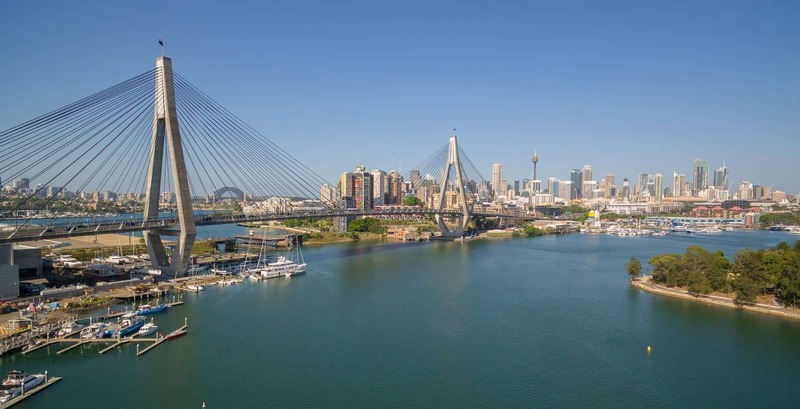 Enjoy a 40-minute walk by starting at the Glebe Point Road, through Bridge Road, over the Bridge and make a turn at Blackwattle Bay before heading back to the starting point. The best time to do this is in the early morning just before sunrise or at sunset. Motorists using the Anzac Bridge must note that there is a speed limit of 60 kilometres per hour. There are no bus stops at the bridge end, as this was seen to create a traffic hazard as the buses joined traffic. In place of the bus stops, the Australian Anzac Statue was erected in the northern side and the New Zealand Anzac statue installed at what was the southern bus stop at the end of the bridge. Anzac Bridge is a must-visit when touring Sydney for its remarkable views and its importance in the city’s history.